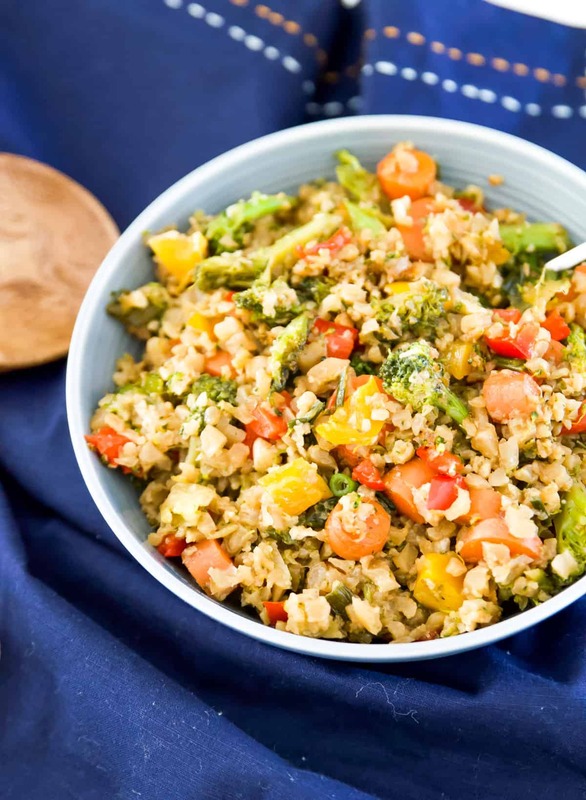 Paleo Cauliflower Fried Rice is a tastier version of plain cauliflower rice. This paleo cauliflower fried rice is full of flavour and is also very easy to make. Also Whole30, keto and vegetarian, everyone is going to love this Paleo Cauliflower Fried Rice. I have a confession to make: I don’t love cauliflower rice. 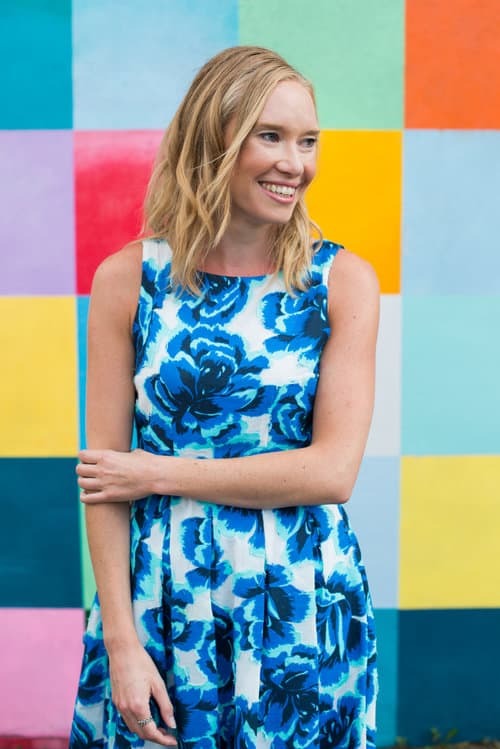 I know, I know, being a paleo blogger it should basically be a staple in my home but I could never get my tastebuds to agree with plain cauliflower rice. Until I starting making fried cauliflower rice that is. Once I started experimenting with different additions and flavours I started to fall in love with cauliflower rice. 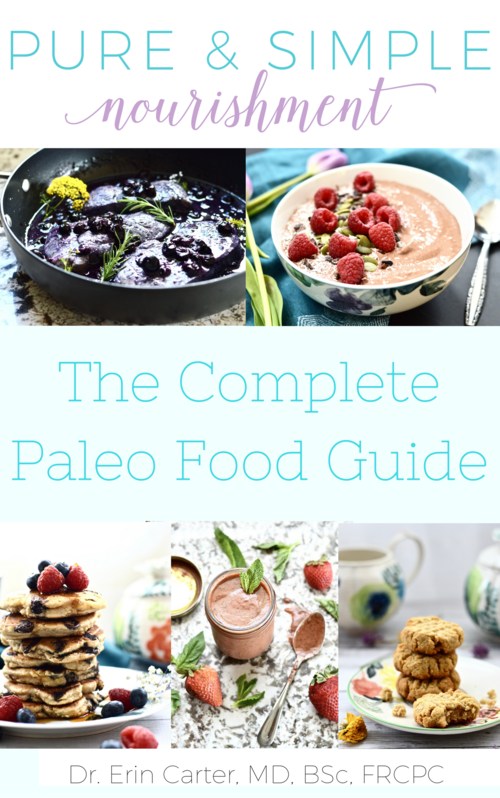 This week I am sharing my recipe for an easy Paleo Cauliflower Fried Rice. It’s loaded with vegetables and doesn’t contain any fancy ingredients or complicated steps. You can make this paleo cauliflower fried rice all in one pan so your clean up will also be super easy (you’re welcome). This paleo cauliflower fried rice is perfect for those busy weeknights and also makes great leftovers. I bet you already have all of the ingredients needed to make this paleo cauliflower fried rice in your fridge and pantry. 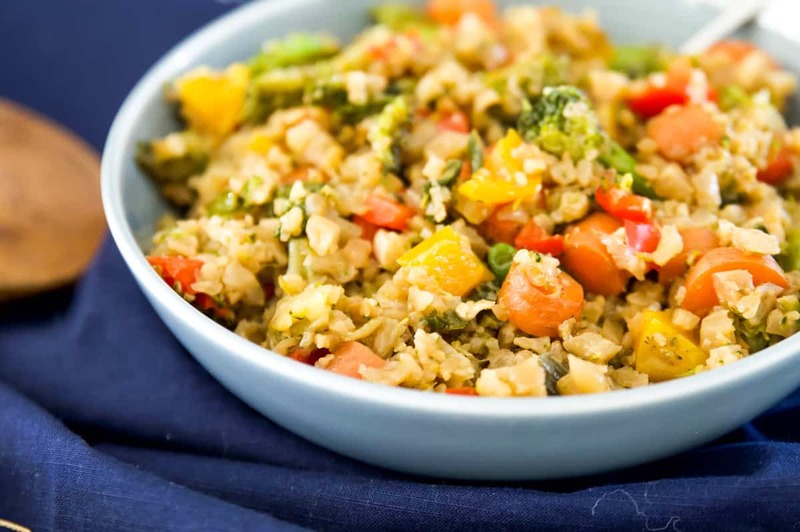 One of the keys to making delicious vegetarian cauliflower fried rice is using a good sauce. 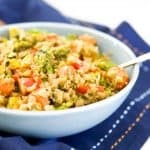 This paleo cauliflower fried rice recipe uses my favourite soy sauce alternative, coconut aminos. Coconut aminos is a healthier alternative to soy sauce. Soy is often marketed as a “healthy food” but I totally disagree. Did you know that soy is the most genetically modified crop on the planet? 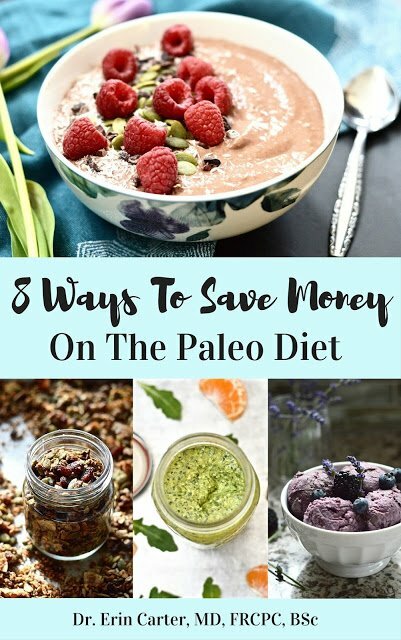 It can also mess with your hormones (it mimics estrogen in the body) and can be really hard on the gut which is why it’s not allowed on the paleo or Whole30 diets. The great thing is that coconut aminos tastes just as good, if not better than soy sauce. It really is a win-win! Coconut aminos are also safe if you are vegan or vegetarian or on the AIP diet. You can see my favourite band of coconut aminos by clicking here. Good news for you, this paleo cauliflower fried rice is incredibly easy to make. Now, the key to making great cauliflower rice is not overcooking it. Mushy cauliflower rice is pretty darn gross if you ask me. So, to make this vegetarian cauliflower fried rice you will need to first rice your cauliflower. Many stores actually carry pre-made riced cauliflower so to save yourself some time I recommend grabbing yourself a bag or two. However, if you can’t find pre-made riced cauliflower, all you need to do is throw some cauliflower florets into your food processor and and pulse until you have rice sized pieces. Then you can finely chop the rest of the vegetables so that all of your ingredients are ready to use. Next you will put a large pan on the stove and turn it on to medium heat. Add the coconut oil and allow it to melt. 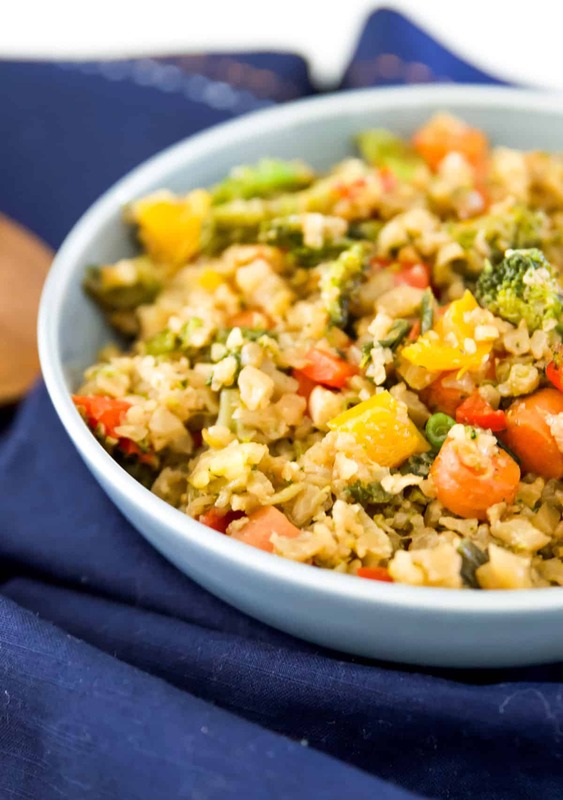 Then, add the broccoli, carrots, peppers and green onion to the pan and cook them for approximately 10 minutes, until the vegetables are the consistency you desire. While the vegetables are cooking, mix the sauce ingredients together in a glass measuring cup or bowl. Then add the riced cauliflower and the sauce to the pan and stir everything well to combine. Cook for another 15-20 minutes and that’s it. 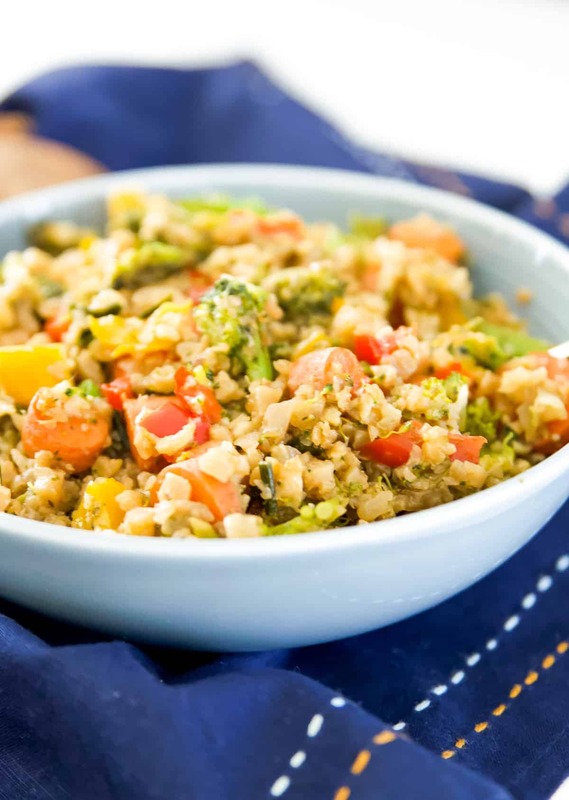 You’re ready to serve and enjoy this paleo cauliflower fried rice! 1. What Does Cauliflower Rice Taste Like? So plain cauliflower rice does taste like cauliflower. Basically cooked cauliflower. However, when you make paleo cauliflower fried rice it doesn’t taste like cauliflower anymore! 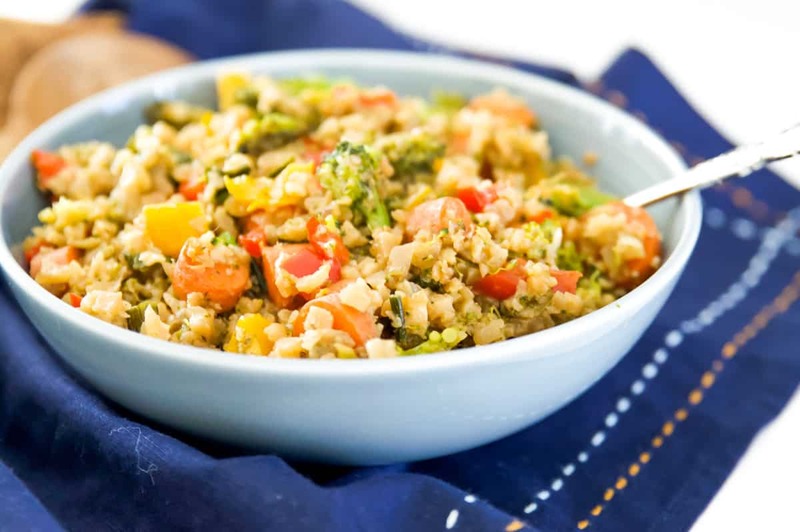 The added vegetables and sauce disguises the cauliflower flavour, so even if you don’t like cauliflower you should enjoy this paleo cauliflower fried rice. 2. Is Cauliflower Rice Good For You? Absolutely! Cauliflower is a very healthy cruciferous vegetable that is high in fiber, vitamins C, K and B6, and potassium. And for those of you following the keto diet, cauliflower rice is also a great alternative to regular rice that you can enjoy. 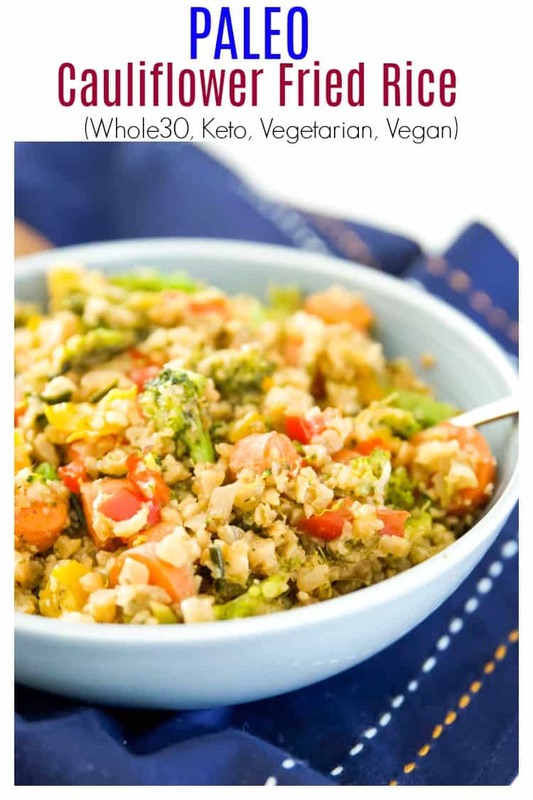 Cauliflower rice is also Whole30 compliant, vegetarian and vegan friendly too. 3. 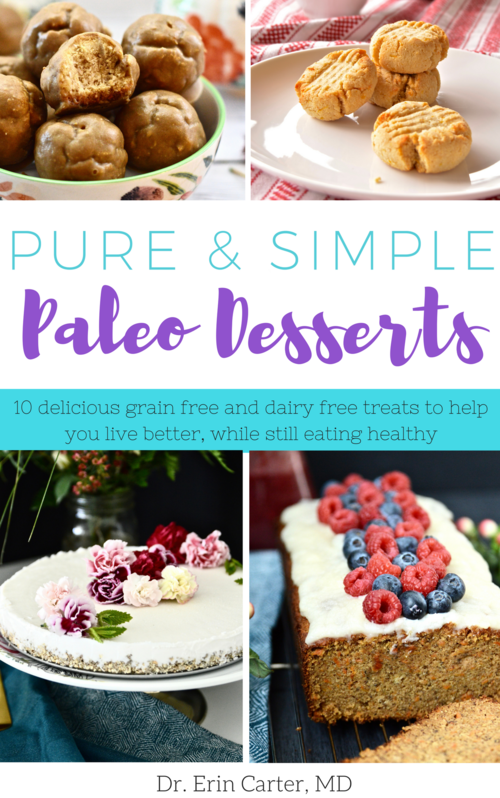 Is this paleo cauliflower fried rice Whole30 compliant? It sure is! Just don’t add the optional honey to the sauce. 4. Is this paleo cauliflower fried rice keto friendly? 5. Is cauliflower fried rice vegetarian? Yes it is. It’s also safe for vegans too! 6. How long does cauliflower rice last? This paleo cauliflower fried rice should last for 5 days if stored in the fridge. You can also freeze it and store in the freezer for up to 6 months (just note that the texture may change after thawing). 7. Does cauliflower rice taste like white rice? No it doesn’t. It has a fairly neutral flavour and the taste will change depending on what other ingredients or sauces you add to it but I don’t think that you will ever get it to taste exactly like white rice. 8. Can you freeze cauliflower fried rice? Yes you can. It will last for up to 6 months when frozen, but just note that the texture may change when you thaw it compared to when it was initially made. Paleo Cauliflower Fried Rice is easy to make and full of flavour. Loaded with healthy vegetables it's vegetarian, Whole30 and keto. Note: If on the Whole30, keto or vegan diets omit the honey. You can substitute maple syrup if you are vegan. Feel free to add more salt and ground turmeric depending on your flavour preference.